The introduction of clinical governance has already had a major impact on health care in the UK. Its implementation is crucial in enabling the quality of health care to become the driving force for the development of health services. Clinical governance is the responsibility of managers and clinicians working at all levels within trusts. Therefore it is vital to have access to clearly written, reliable information on clinical governance and be equipped to deliver these complex and challenging roles in a fast-moving environment. 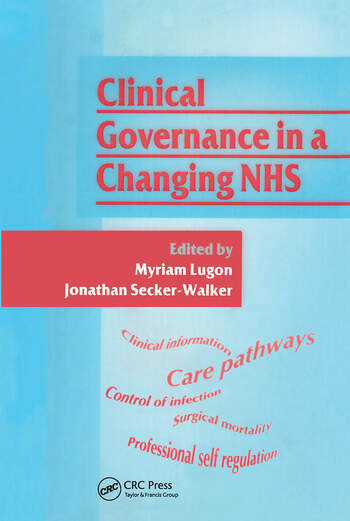 This book is the long awaited follow-up to Advancing Clinical Governance Advancing Clinical Governance in which clinical governance experts Myriam Lugon and Jonathan Secker-Walker have pulled together chapters on key topics for the present and future development of the health service. Amongst the 16 topics covered are the provision of medical staff in the future, the future role of nurses in clinical care, clinical information, resolution of professional disputes and infection control. The book also includes a valuable guide to up-to-date information sources on clinical governance. This book is recommended to clinicians and managers at all levels within trusts, health care purchasers and academics.